SLIM Technologies announces the industry’s first supply chain design solution that can simultaneously optimize cycle times and supply chain costs. This capability and other new features now available in SLIM(TM) version 9.0 were demonstrated today at the Council of Supply Chain Management Professionals (CSCMP) Learning Exchange, attended by over 3,500 supply chain managers. Cycle time analysis has become a critical factor due to trends such as worldwide sourcing and global market focus that have lengthened supply chains and added tremendous complexity. It is no longer sufficient to simply minimize costs when designing the optimal supply chain network. That’s why SLIM Technologies has added break-through abilities to optimize supply chain cycle times as well as costs while meeting desired service levels. As a result, when developing supply chain networks that support their business strategies, SLIM users can easily and comprehensively analyze tradeoffs between lead times and supply chain costs, including inventories and investments. SLIM has an impressive record in addressing a broad range of supply chain design issues for clients in the retail, consumer goods, industrial manufacturing and medical industries. It has helped companies eliminate millions of dollars of supply chain costs, increase profitability and improve supply chain performance. Global 2000 companies, such as IKEA, Doane Pet Care, Genecor International and Hudson’s Bay Company, are using SLIM to gain significant financial and performance benefits. Improved transportation modeling abilities. Sourcing constraints can be applied to individual locations and/or user-specified groups of locations to ensure that product flows accurately reflect actual transportation best practices. Sophisticated abilities to model the distribution of related products. Proportional flow constraints ensure that related products flow in the correct proportions, which means that optimization solutions accurately reflect real-world distribution methods and policies. Enhanced reporting and mapping. Dozens of enhancements to SLIM’s reporting and mapping capabilities are included. Enhanced data wizards. Significant enhancements to SLIM wizards that assist with creating, editing and managing data sets are also available. Steve Wagner, SLIM Technologies VP of Consulting Services, noted “Clients using Version 9.0 have been extremely enthusiastic. The new release has proven to be particularly effective for companies with intense transportation and distribution modeling requirements, especially where multiple transportation modes are possible with different costs and transit times. Our new release has added substantial value in analyzing tradeoffs between those transport costs and delivery lead times." SLIM Technologies has been helping leaders in the retail, consumer goods, industrial manufacturing and medical products optimize their supply chain strategies since 2000. Based on years of experience, we understand that “one-size fits all” supply chain network modeling doesn’t work in today’s complex global supply chains. 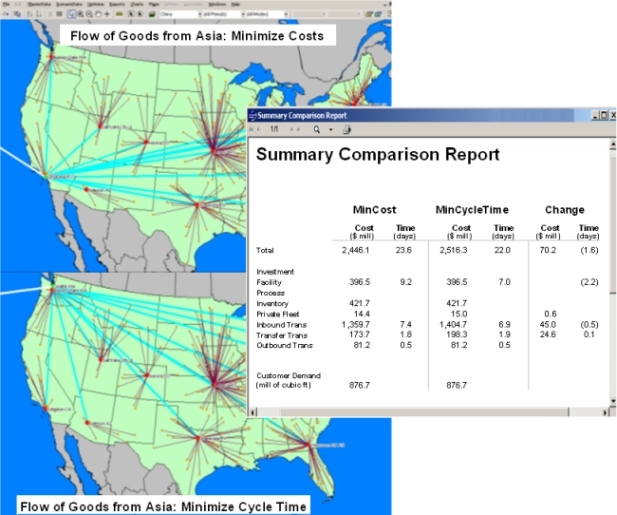 That’s why our supply chain design software offers Pinpoint Optimization, or the unique ability to move from macro to micro analysis across all critical supply chain dimensions – time, geography, costs and capacities. Customers like Alcoa, Best Foods, Canadian Tire, Doane Pet Care, Finn Forest, Genencor and IKEA enjoy substantial cost savings that translates directly to their bottom line. Analysis of Flow of Goods from AsiaResults of two scenarios optimizing the flow of goods from Asia. First scenario minimizes costs, and the second minimizes cycle time.